The colors of fall blur by your car window as you travel down the secluded back roads of Lee, New Hampshire. The sun is just beginning to set, and you'll arrive as the shadows start to slowly blanket the land. You can almost physically feel yourself begin to slip into the twilight, the world between the physical and the fantastic. The excitement you feel in the pit of your stomach begins to grow but so does the dread in the back of your mind. What have you signed yourself up for? No time to wonder, there's a sign post up ahead- you're almost there. You turn off the main road and onto the loosely paved gravel, the final road leading to Haunted Overload. You find a place to park in the expansive green fields and exit your vehicle. Immediately, you feel that there is a spell about this place, an almost tangible mood hangs in the air. The sun is quickly fading now, and other cars are just beginning to arrive in numbers. You turn towards the farmstead and begin to make your way towards the ticket booth. 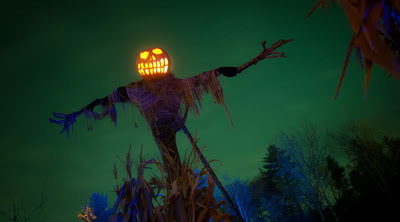 As you make your approach, your eyes cannot help but be drawn to the twenty-foot monstrosities towering over the walls of the indoor/outdoor haunt. You're not even in the haunt proper yet, but you've never seen creations like these. You're in for a wicked night. 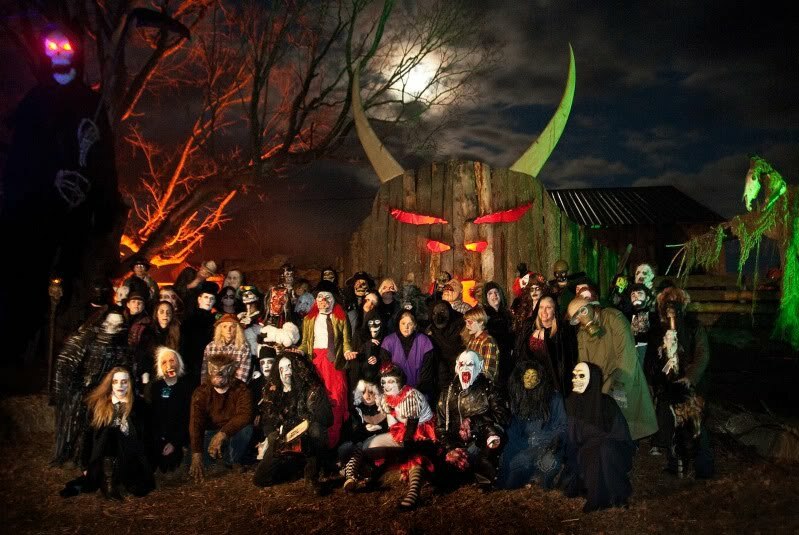 For the uninitiated, a haunted attraction is a Halloween-themed locale where costumed actors attempt to surprise and scare fun-seeking patrons. Although this is still an apt description of what physically occurs within its walls, to call Haunted Overload a haunted attraction almost does it a disservice. 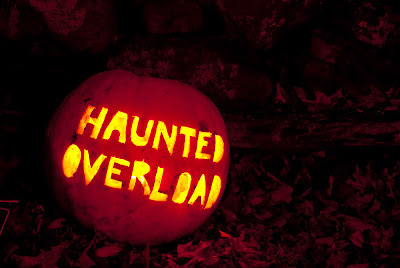 Haunted Overload is not your average haunt. You will not find the same store-bought props and costumes that populate many other attractions of this type. Lead by haunt creator Eric Lowther, the entire cast and crew of Haunted Overload clearly have a deep love and respect for the season. The sheer amount of time and hard work that goes into preparing the haunt for each year is astounding. Their passion is obvious when one observes the countless hand-made horrors found within. 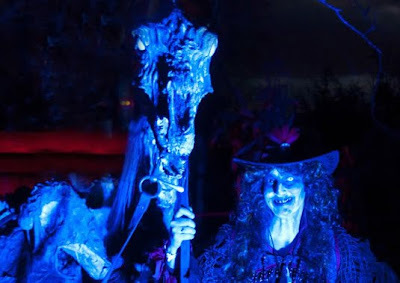 If you have an eye for such things, you will quickly recognize the artistic merit that permeates the entire Haunted Overload experience. The various set pieces are impressive for a multitude of reasons. 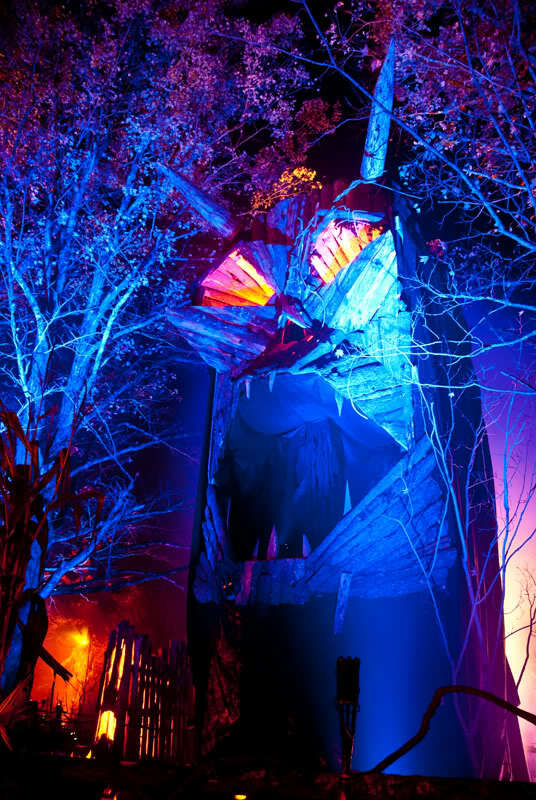 As a direct example, early in the haunt there is a large structure, a wooden tower whose front has been crafted into a demonic, gaping maw. The scale and carpentry alone would suffice to impress, but the tower is also functional. A costumed actor can be seen pacing around this elevated perch, calling doom upon the mortal patrons passing below. The element that truly transforms this tower is the careful use of colored lights to add dimension and depth to the demon's face. The final product is a majestically spooky set piece, much more than the sum of its wooden planks and colored gels. No longer a mere tower, the wrathful demon, its head jutting forth from the earth, struggles to break free and unleash itself unto our world. Beyond the artistry of the sets and props, special mention is due of the haunt's actors. The set pieces create the mood, but it is the actors that drive the tempo and give the haunt its scares. First, the costumes are incredible. It seemed to me that everything is either hand-made or modified. It is my understanding that many of the actors put together their costume and create their ghoulish persona on their own. To these people, I give my applause. Their hellish creations are both imaginative in appearance and demeanor. The actors give life to their characters in ways that compliment the artistry on display elsewhere in the haunt. I was especially impressed by the use of low moans and guttural growls. Quiet noises serve to change the tempo, mentally putting patrons off-balance, and thereby making the next big jump scare that much more effective. All of the actors seemed to understand the importance of this oscillation well. Special mention goes to the actor who portrayed the demonic crow last year. Your terrifying caws and unsettling neck movements earned you the favorite spot amongst the group with which I attended. Being that 2009 was my second year visiting Haunted Overload, I wanted to keep an eye open towards how the haunt had changed from the previous year. I'm happy to report that the journey through Haunted Overload was substantially different. The path itself had been re-routed, with various returning set pieces being visited in a new sequence. Although I recognized some of the same buildings, the interior set pieces had been shuffled, replaced, or redesigned. Modifications in actor placement and routines were also apparent. For example, in the cornfield you encounter a tall demon with a melted face. The previous year, this demon was played by a live actor, menacingly banging his chain against his wooden shack. As I approached the demon, I kept waiting for him to lunge at me, but he never did. As I passed by, I realized the ugly brute was now a statue. A simple change, but one that worked off my own memories, misleading my anticipations. 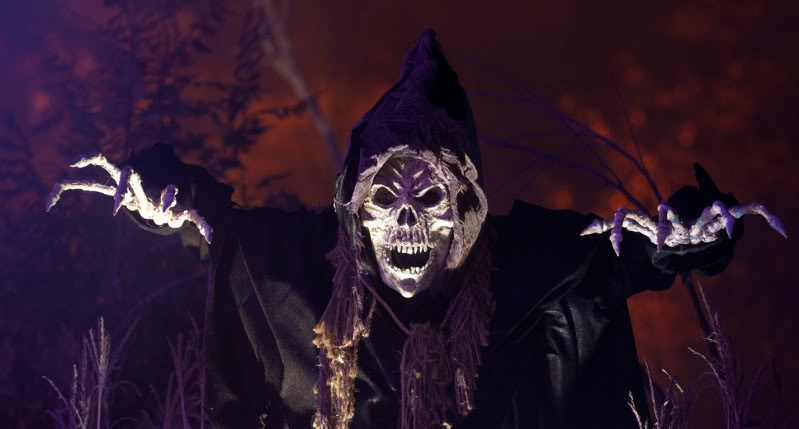 There were also several additions to the haunt that were completely new for 2009. The graveyard was expanded in length and several 12-foot tall grim reaper statues were added. I found these creations to be extremely impressive based on their detail alone, but that feeling was furthered by the disclosure that the statues were designed to be fully articulate and pose-able! There was also a new ghostly, skeleton-horse, affectionately known as Mr. Ded. Between the lighting and the detail work, you'd swear this deathly horse were the real thing. Another honorable mention goes to a spooky automated rocking chair, which I stared at for several minutes trying to figure out if the seated witch were real or not. 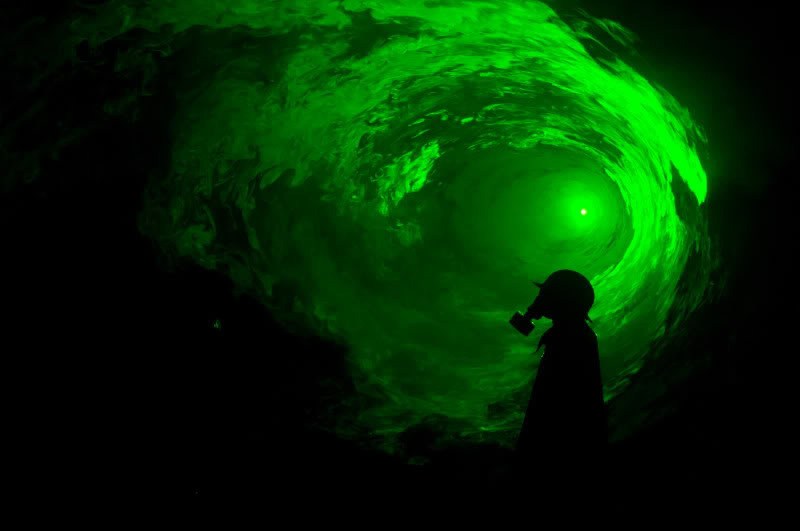 Finally, amongst my group, the most impressive new feature to Haunted Overload in 2009 was voted to be the swirling green-fog vortex tunnel. My friends lost themselves in the effect of the swirling lights and I loved the way that the actor portraying the ghostly miner would fade in and out of vision depending on how deep he stood in the tunnel. More than just the movie quality sets and the high quality scares, it's the plainly apparent appreciation for the season that makes Haunted Overload the definitive Halloween destination. The love and passion combined with the home-grown atmosphere has completely won me over. 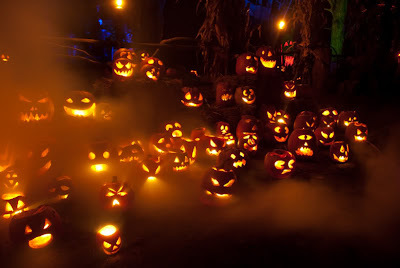 Eric Lowther and his crew have succeeded in crafting an experience that captures the very essence of Halloween. Much more than the sum of its sights and sounds, Haunted Overload is a celebration of the outer boundaries of the human mind. I look extremely forward to the upcoming season and seeing the new venue in 2010. As always, comments are welcome below. 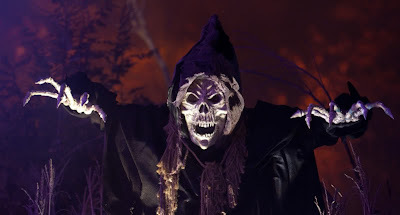 If you enjoyed this review, may I suggest checking out my review of the 2008 season at Haunted Overload. Copyright B-Movie Geek, 2008-2019. Powered by Blogger.